Where are all of my brussels sprouts fans? This salad is for you! Even if you’re not obsessed with brussels sprouts like I am, you’re going to love this salad. 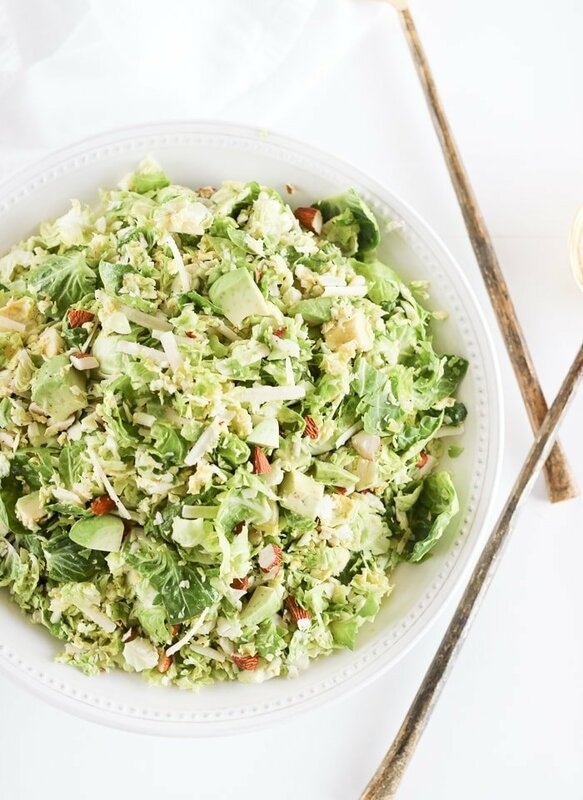 I thought that roasting brussels sprouts was the absolute best way to eat my favorite vegetable, but it turns out that this shaved brussels sprout salad is making me question my long-standing favorite. Is raw and shredded actually the best way to eat brussels sprouts? Have I been missing out all this time? OH MY GOD! 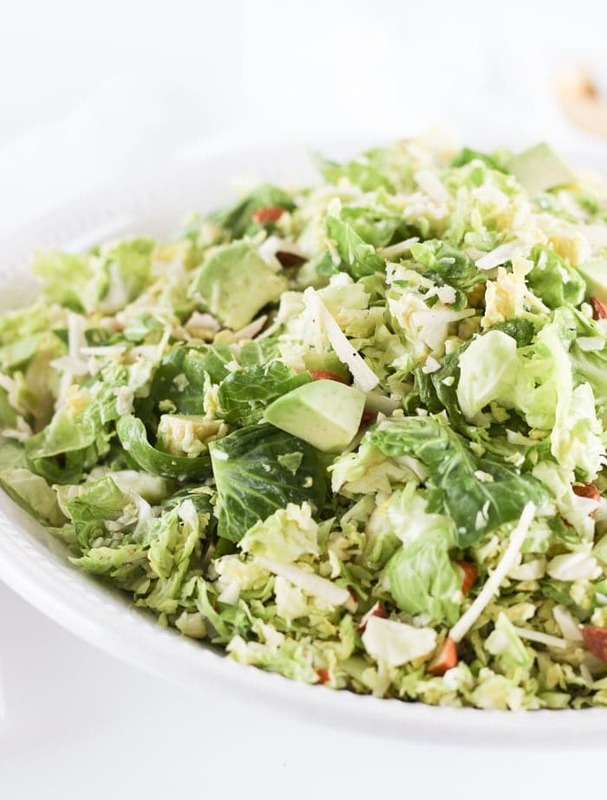 Make this delicious shaved brussels sprout salad and decide for yourself. Mr. Table has been loving it lately, so you know it’s good. Husband approval is always a sign that you have a winner. Now, to the ingredients. 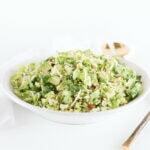 This shaved brussels sprout salad is super easy to make. Just shred your cute little brussels (I use a food processor, but you can also use a mandoline, or a good old fashioned knife), toss with a few simple, but key, ingredients, and you have one addictive salad. Don’t omit anything. 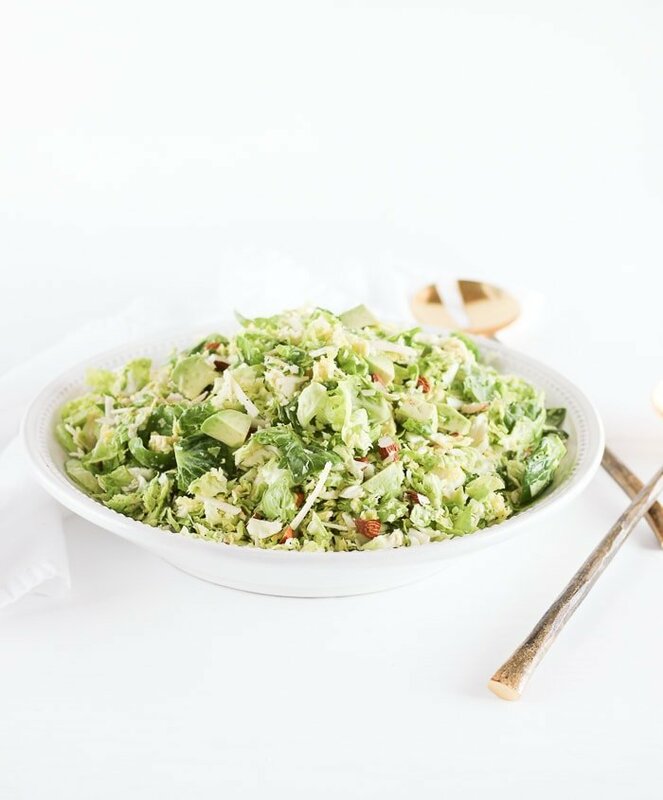 You need the crunchy almonds, savory parmesan, and creamy avocado to achieve the perfect balance that makes this salad amazing. The homemade citrus shallot vinaigrette just puts it over the top. Again, do NOT omit! You need it ALL! The great thing about this delicious salad is that it makes great leftovers. (The recipe makes a big salad.) The shaved brussels sprouts hold up so well to the dressing as it sits in the fridge, so if you have leftovers, your lunch is already made for tomorrow. That is IF you have leftovers, because you might just devour the whole salad in one sitting. No shame. I totally get you. Shave brussels sprouts using a mandolin, food processor, or knife. Place in a large bowl with almonds, cheese, and avocado. In a blender or food processor, blend remaining ingredients. You may also whisk them together in a small bowl, just be sure to finely chop the shallot and parsley. Pour dressing over brussels sprouts and gently toss to coat. Serve, or place in the refrigerator until ready to serve.